We know the stress dietary issues can have on your patient’s life. VSL#3’s long history based on recognized scientific principles is supported by over 190 studies and reviews. 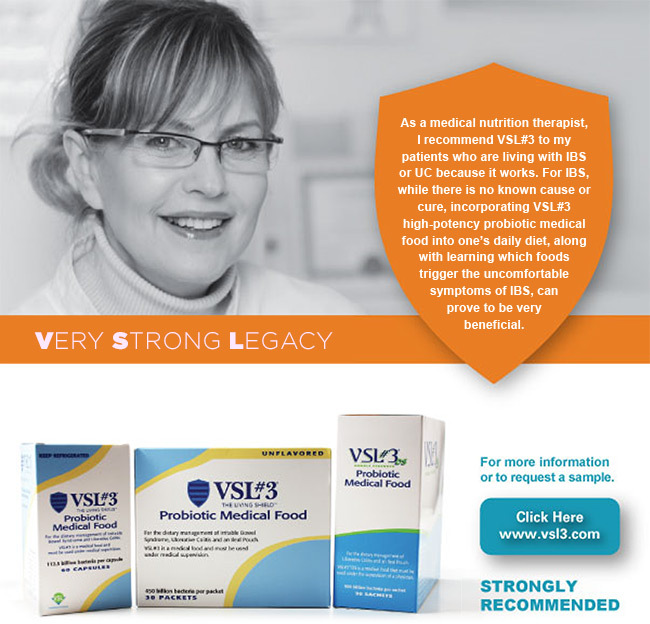 VSL#3 probiotic medical food contains 8 strains of live bacteria that provide specific nutritional requirements that come from having a medical condition, such as IBS, which cannot be met by simply modifying your patient’s diet. For an even more potent probiotic, you can recommend VSL#3 DS (double strength). Each sachet of VSL#3 DS delivers 900 billion live bacteria, making it one of the most potent probiotics on the market. VSL#3 DS’s superior potency makes it the clear recommendation, and the strongest choice for patients with ulcerative colitis. VSL#3 is a high potency probiotic medical food for the dietary management of UC, an ileal pouch and IBS. It must be used under medical supervision.